Have you ever dreamed of becoming an astronaut? It's actually not that crazy of an idea, and it's totally possible if you set your mind to it. But you may be surprised about the best path to getting there. It's actually through MIT, the legendary engineering school in Massachusetts. 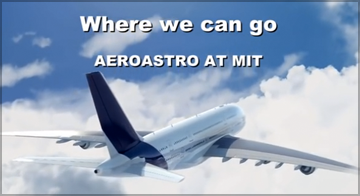 They've got something called the Department of Aeronautics and Astronautics, which is probably better known these days as @MITAeroAstro. This is a program where students learn everything from how to fly drones, to how to build airplanes, and even how to venture into space. With MITAeroAstro though, you really just have to see it to believe it. So check out the cool video below and see for yourself. And if you think it looks exciting, then here's some good news: you can actually get involved with MITAeroAstro as early as high school. They just announced a competition where hundreds of teams worlwide are going to launch high altitude balloons in April. You can learn about the competition (and how to enter it) over at MIT News. We'd love to hear your thoughts in the comments section below. If you want to get into space, is MIT one of the best ways to get there?